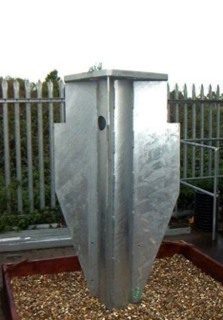 Angel Piles are a helical pile with a winged sleeve attachment that is driven over the shaft of a standard pile to give the foundation extra lateral stability in soft soil. This form of foundation is installed using a vibrohammer. All Angel Pile connections are steel-to-steel, and the verticality of the pile is not an issue due to the connection detail. This is a very quick and efficient method which allows fast installation, excellent stability, and solid connections. One of our recent projects using Angel Pile foundations involved installing eight CCTV cameras to monitor the roads around Gleneagles Hotel. This method allowed the main contractor to install all of these foundations within one week – something that would have been impossible using conventional foundations.